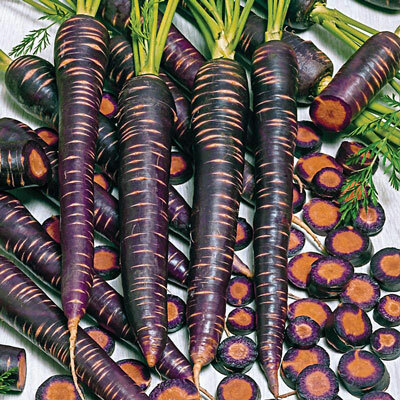 Purple Haze Hybrid Carrot | Henry Field's Seed & Nursery Co. This All-America Selections winner boasts a deliciously sweet flavor coupled with a bright purple skin. Vibrant orange flesh is packed with vitamin A and antioxidants, too! Smooth, 8- to 10-in.long roots are perfect for fresh eating. 90 DAYS. Seed Counts: 1/2 oz. of carrot seeds contains about 8,000 seeds and sows 100 ft. of row. Spacing: 12 inches. When large enough to handle, thin out the seedlings within each row to 4 inches apart. Blooms: Harvest - July to December depending on sowing date. Soil Requirements: Fertile, light, well drained soil. Fruit: 8 - 10 inch long, smooth, rich purple skin contrasts well with the deep orange flesh.